Schmitt, John W. and J. Carl Laney. Messiah’s Coming Temple. Updated Edition. Grand Rapids, Mich. Kregel, 2014. 248 pp. Pb; $16.99. Link to Kregel. This book is an update to Schmitt and Laney’s original 1997 Messiah’s Coming Temple, adding three chapters and about 50 pages to the original. In addition to this new material, there are a number of new illustrations including new 3D models of the temple. All illustrations are in black and white, some of the 3D images are on Schmitt’s Future Hope Ministries website. Like the original, this is a popular level introduction to Ezekiel’s vision of a future temple. The book is designed to be read by laymen, so there is little discussion of wider scholarship on the vision. The first two chapter of the book survey the history of the Temple in the Old Testament. After a description of the Tabernacle, Schmitt and Laney give a brief sketch of the history of the Tabernacle and the Temple. The section on the Tabernacle creates a typology between various elements of the Tabernacle and Jesus Christ. For example the “single entrance” to the Tabernacle foreshadows Christ is the one door of access to the Father (citing John 10:9). As popular as these typological observations are, I have never found them convincing. Several key Hebrew terms appear in these chapters, but unfortunately the authors define temple by using Webster’s Dictionary rather than a Hebrew lexicon. The chapter does not compare Solomon’s temple to other Ancient temples. The history section begins with Solomon, runs through the the destruction of the first Temple and the rebuilding of the second Temple, Herod’s renovations and finally the fall of Jerusalem in A.D. 70. Chapters 3, 5 and 8-10 focus on the book of Ezekiel. The third chapter introduces the reader to the prophet Ezekiel in offers a general overview of the book. Chapter 5 is a new chapter in this edition of the book, comparing the temple in Ezekiel’s vision to several to the Solomonic gates at Megiddo, Hazor and Gezer. The chapter includes excellent photographs and several charts illustrating similarities. My only criticism here is the chapter relies on Biblical Archaeology Review articles rather than direct reports from archaeologists. This is simply the nature of a popular book, but a “for further reading” section would have enhanced this chapter greatly. Schmitt includes a section on Mount Gerizim since the Samaritans built a temple there after then time of Ezekiel’s vision. Unfortunately the temple has not been fully excavated because of Byzantine church was built on top of the Gerizim Temple, but it would be interesting to compare the general layout of the Samaritan temple to Ezekiel. In chapters 8-10 the authors examine the details of the prophecy in the book of Ezekiel, beginning with a survey of the various interpretations of the vision. Some take the vision as a “memorial of pre-captivity temple,” others see it as the real postexilic temple. Others have understood the vision as an allegory of the heavenly state or the present church age. For Schmitt and Laney the vision is a literal temple, a “building in the future kingdom.” The section is good overview although I would have appreciated footnotes to commentaries espousing each of the five views presented. The rest of these chapters survey the vision and offer some architectural comments. Reading the text in Ezekiel is difficult, these notes attempt to summarize and clarify the visions. Chapter 6 is a new section in this updated edition. Schmitt and Laney survey several other predictions of future temple, calling these predictions “different temples.” Perhaps this chapter was added in response to critiques of the first edition of the book, which did focus on only Ezekiel. Chapter 7 offers a short introduction to Schmitt and Laney’s view of eschatology. “What is next on the Prophetic Calendar…” Chapters 6-7 were an interruption of the theme of the book (Ezekiel’s temple) and the book could be improved if these chapters were moved either before or after the survey of Ezekiel. Chapters 10-15 concern the future temple, often moving beyond the text of Ezekiel. Here Schmitt and Laney develop the outline of eschatology presented in chapter 7 and deal with a number of “problems” associated with a literal future temple. First, chapter 10 discusses future predictions of the temple and the antichrist attack on that temple. They are adamant the future temple is designed for the Messiah. The problem is: are there two temples, one during the tribulation and a second, new Temple during the kingdom? Second, Schmitt and Laney discuss the problem of an altar and sacrifice in the future temple (ch. 11). This of course is only a problem for premillennialists who believe that Christ’s sacrifice on the cross puts an end to Old Testament sacrifices. For some Jews, Ezekiel’s references to an altar are also problematic since it is been two millennia since sacrifice has been made in the Temple. The authors conclude there will be sacrifices in the millennial kingdom and they will serve as a continuous memorial that the Messiah has come (140). Third, the last new chapter in the book answers the question “Can Sacrifices Be a Part of a Future Temple?”(ch. 12). This chapter answers the question of the previous chapter. It explores the purpose of the sacrifices in the temple during the millennial kingdom. They conclude that Ezekiel’s temple sacrifices do not violate the mosaic system of worship because they are another in system entirely (158). Fourth, Schmitt and Laney discuss the future temple and the land of Israel (13). Here the authors deal with several suggested locations for the original temple, but also the prophetic location of the future temple. Ezekiel’s map of Israel is idealized for the messianic Kingdom and there are a host of problems with the order of the tribes and the position of the temple. Fifth, chapter 14 describes what Schmitt and Laney see as “life in the messianic age.” This chapter goes far beyond the confines of Ezekiel to describe what the eschatological age looked like in Old Testament prophecy. This age will be a time of peace, joy, holiness, comfort, healing of sickness, freedom from oppression, and economic prosperity. It will be a time characterized by the personal presence of the Messiah and the universal knowledge of God. It is a time when Jerusalem is at the center of all worship in the world. Last, Schmitt and Laney list a few items missing from the future temple and offer some explanation for their absence (ch. 15). There are eight missing items listed in the book: the wall of partition, the court of the women, the laver, the golden lampstand, the table of the showbread, the altar of incense, the veil separating the Holy of Holies from the rest of the Temple, and the Ark of the Covenant. In addition to the missing items division has a different view of the altar in the temple. Ezekiel uses a different word for altar in 43:15b, אֲרִיאֵל (ʾărîʾēl), although the altar is also spelled הַרְאֵל (harʾēl) in 43:15a. On pages 190-1 the authors transliterate this as ariel and state the root of this unusual word means “lion of God.” They then argue the name of the altar in Ezekiel “lion of God” is an allusion to Judah as a lion in Gen 49:9 (אֲרִי, lion, plus אֵל god). This in turn looks forward to the Messiah is the Lion of the Tribe of Judah (Rev 5:5). While the word could be construed as a proper name meaning lion of God, their argument seems to me to be quite a stretch. The Mesha Stele uses the related word אראל in reference to a “hearth of an altar” (HALOT) and a similar word appears in Isa 29:1 as a metaphor for Israel as a whole. The etymology of “lion of God” may not be valid and it is even stranger to force the name of the altar into a typology of the Messiah. My criticism here is driven by the popular level of the book. An introduction like this book is probably not the place to discuss the complicated problems of the etymology of Hebrew words. On the other hand, since the problems exist it is probably safer to make typological claims more tentatively. Conclusion. This is a very easy to read introduction to the Temple both past and future. Premiliennialists (and dispensationalists) will feel comfortable with the ideas presented in the book, although this terminology is not used in the book. The closest they get is in chapter 7 where they discuss the rapture of the church; Laney is pre-tribulational with respect to the rapture and Schmitt leans to mid-tribulational rapture (88). This is the language of dispensationalism, even if the writers want to avoid the term. I find it strange these terms would be omitted from a book so friendly toward dispensationalism. In fact, Laney has a doctoral degree from Dallas Theological Seminary. I suspect this is simply to create some space between the book and more popular (and strange) forms of dispensationalism. While the sub-title of the book clearly states the book is about Ezekiel’s vision for the future temple, I would have appreciated a chapter relating Ezekiel’s vision to the New Jerusalem vision in Rev21. Since the book is not concerned only with Ezekiel, I think there is space for Revelation. Thanks to Kregel for kindly providing me with a review copy of this book. This did not influence my thoughts regarding the work. Peter calls Jesus “God’s Servant.” The title “servant” was not usually an honor prior to the Christian use the word. Since the idea of serving God is so much a part of Christianity, we miss the impact of the word as a title for Jesus. The activity of a servant of God in Isaiah 49-53 is critical for understanding who Jesus was in Peter’s sermon. 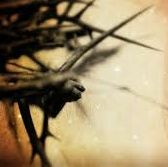 The servant suffered unjustly at the hands of sinners. Because he suffers Israel will be saved and he will be a “light to the Gentiles. Many Jewish readers of Isaiah would understand the servant of God as Israel as a while, suffering in exile until the time of the messiah. Christians quickly developed the idea Jesus was the fulfillment of the suffering servant primarily because of Jesus’ own mission as a servant. Mark 10:45 Jesus claims to have come to serve. Certainly the suffering of the Cross resonates with the suffering of the servant in Isaiah 53. The idea of the messiah as servant appears in other texts as well from the first century, 2 Baruch 70:9, for example as well as the Targum Jonathan on Isaiah 41:1 and 52:13. The Jews gathered for worship, prayer and the study of scripture in the Temple courts would not have missed the allusion to Isaiah 53: the Servant of the Lord who suffers on behalf of Israel. Peter’s words align closely with LXX Isaiah 52:13, the servant/child (παις) will be glorified (future passive of δοξάζομαι). Peter shifts the verb tense to aorist to refer to the now past crucifixion but otherwise the allusion seems clear. David Moessner pointed out several other words present in Acts 3 that indicate he has Isaiah’s servant songs in mind (cited by Keener, 2:1085). In Acts 3:14 Peter calls Jesus the “holy and righteous one,” additional language drawn from Isaiah (41:14, 43:3, 47:4, 48:17, 49:7, 54:5). In fact, Isaiah calls God the “Holy One” frequently. Keener points out pagan kings would call themselves “righteous” (1:1091), but a Jewish audience would have heard an echo of scripture, Noah or Enoch were “righteous ones,” but most importantly the servant of God is “my righteous one” (Isa 53:11). Finally, God glorified Jesus his servant by raising him from the dead. A Jewish person in the crowd might have objected that Jesus could not be the messiah since he was dead – a valid point. But the resurrection and ascension of Jesus and demonstrate that he is the messiah, since his glorification is to the ultimate place, the right hand of the father. 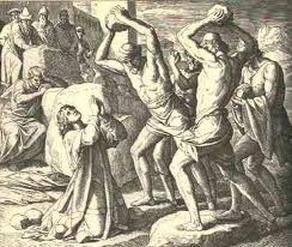 What is the significance of Peter’s allusion to the Suffering Servant of Isaiah? To what extent is he calling attention to the whole context of Isaiah 40-55? This was a popular text among Jews in the Second Temple since it looks forward to the end of the Exile, is Peter claiming the exile came to an end with the death of Jesus? When Peter addresses the crowd in Acts 2, he argues Jesus’s death fulfilled God’s plan, and Jesus was vindicated by God in his resurrection and ascension. The death of Jesus was according to God’s purpose and foreknowledge, but humans are responsible for his death. There is a fine balance between divine sovereignty and human responsibility here: God determined the death, and people freely chose to kill Jesus. Both of these words (ὁρίζω and πρόγνωσις) are theologically packed words. God was not surprised by the death of Jesus, but knew fully what was going to happen because he had planned it ahead of time. But Jesus is not dead because God has raised him from the dead in fulfillment of prophecy. Peter goes about proving the resurrection quite a bit differently than we do today. He does not mention the empty tomb or challenge the Pharisees to produce a body to prove that Jesus was really dead. Rather than pursue modern logical arguments, he turns to the Psalms and shows that David does not exhaust the meaning of the text. Since the messiah is to be a new David, the psalms Peter cites are turning into prophecies of Jesus’ resurrection. Peter quotes Psalm 16:8-11, where David states his faith that God will not abandon him in the grace not allow him to see decay. Peter states the obvious: David died and was not resurrected and his tomb was not far from the location of this sermon. Perhaps people in the audience had already visited the tomb of David during their visit to the City. In the Davidic Covenant (2 Sam 7) David was told he would not fail to have a man on the throne. This text was also generally thought to refer to a future messiah. For Peter, Psalm 16 is a prophecy of the resurrection of Jesus. To further his case, Peter also cites Psalm 110, another well-known messianic prophecy. There David is told that he would be exalted to the very throne of God and that God would make all his enemies his footstool. This prophecy cannot have been exhaustively fulfilled in the life David. Although David was given great victories, and he was the greatest king in Israel’s history, he was not raised to the level of the throne of God! Peter therefore tells the crowd that Jesus non only rose from the dead but was taken up to heaven like Elijah or Moses (or Enoch, for that matter). In those three cases, the person was a highly respected prophet who did not experience death. Like the great men of old, God confirmed Jesus’ message by doing miracles through him, but he allowed him to die in order to initiate the new covenant. Since Jesus fulfills the psalm which David could not, he is confirmed as the Lord and Christ (verse 36). This is the most shocking point in the whole sermon – everything which the Hebrew Bible looked forward to had happened with Jesus, he was in fact the Lord and Messiah. But Israel crucified him! 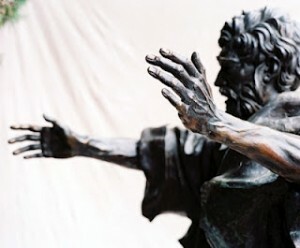 Here the finger points at the crowd, since they were a part of the people who shouted for Pilate to crucify Jesus. Perhaps they followed Jesus the cross mocking him and watched him suffer before going off to celebrate the Passover with their families! This is the real point of the sermon – God sent his messiah, but Israel rejected him. Thinking back to the life of Jesus, what are some additional things Peter might have included in this sermon? In what ways did Israel reject Jesus as Messiah? 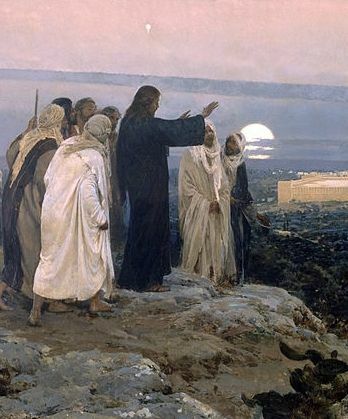 While in Jerusalem, it appears that Jesus and the disciples gathered in their usual location on the Mount of Olives (1:6-8). Some disciples asked if Jesus was going to “restore the kingdom to Israel” at this time. After the resurrection, it was only natural to think that Jesus would now enter the Temple in the power and glory of the resurrection and begin to reform the religion of Israel and begin the process of evangelizing the nations. Again, this was a clear expectation of the Messiah’s activity. Beginning with the people of God themselves, Messiah would either convert the enemies of Israel or destroy them (depending on their response or the attitude of the writer describing Messiah’s activities!) Very often these enemies were within the nation itself. Individual groups identified the primary enemy of a pure Jewish faith as corrupt priests, people who did not fully keep the law, etc. The verb that is translated “restore” in this context (ἀποκαθίστημι) is a key eschatological term. It appears in Mal 4:6 (LXX 3:23) and LXX Daniel 4:26, and it anticipates Acts 3:21 where the related noun appears in an eschatological context. The hope of Israel was that the kingdom would be restored to them as the prophets had predicted (Isa 2:2-4; 49:6, Jer 16:15; 23:8; 31:27-34; Amos 9:11-15). In fact, Luke began his first book with the hope of the coming Messiah in the Song of Zechariah (Luke 1:69-74) as well as the words of Simeon in the Temple (Luke 2:24-32). Jesus reminds them it is not for them to known when the kingdom will be restored, but they are to be witnesses to the good news of Jesus in Jerusalem, Judea, Samaria, and all the earth. To some extent, the kingdom is about to begin in the Temple in a manner which is not unlike what many expected. The Holy Spirit will fall upon people and they will speak the Word of God in power in the Temple itself. What is unexpected is that the kingdom would be given to a group of Galileans rather than a faction within Judaism (Pharisees, Essenes, etc.) was not expected at all. From the perspective of Second Temple Judaism as we understand it, these people would be the most unlikely group to be the witnesses of the Messiah to Israel and then the rest of the world! But this “unlikely group” is another example (in Luke/Acts or the whole Bible) of God choosing to accomplish his goals through the most unlikely and weak things of this world. The restoration of the Kingdom begins with the preaching of two Galilean fishermen in the Temple courts, announcing the death and resurrection of the Messiah. Are there other elements of “restoration” in Acts 2-3 we ought to include here as well? Common wisdom often equates the earliest example of something with the most pure form. 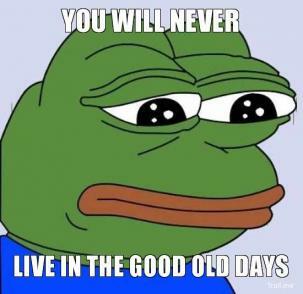 Things were best in the “good old days” and we need to get back to those good old days in the present church. But the earliest is not always the best. It is also true ideas develop over time. Sometimes the earliest form is simpler or more pure, but not necessarily better than the more mature forms. While I might be nostalgic for my first computer, I am not really willing to go back to using a Commodore 64. The argument Acts ought to be normative for church involves the practice of the early Christians, not doctrine. Obviously doctrine develops later with the Pauline letters and later Christians who seriously thought through who Jesus was and what he did on the cross. The book of Acts describes a development from an entirely Jewish messianic movement to an almost entirely Gentile missionary movement. There are distinct difference in practice between the Jews in Acts 2-3 and the Gentile churches Paul establishes in Corinth or Ephesus. Nowhere does Paul suggest Gentile believers live a life of voluntary poverty. In fact, he tells the church at Thessalonica to work hard to avoid being dependent on anyone (1 Thess 4:11; 2 Thess 3:6-12). The later New Testament documents have no system for appointing new apostles. There are few people who consistently apply the “earlier is better” thinking. No one should use Ananias and Sapphira as an example of what happens to poor givers to the church! In addition, the book of Acts seems to indicate that the earliest form of Christian was far less unified than we sometimes imagine. By Acts 6, there is some division between Hellenistic Jews and the Jews from Judea. There seem to be some Christians who were Pharisees and taught that Gentiles ought to keep the law, so that by Acts 15 a “church council” must be called to deal with this issue. We can talk about Paul, Peter, and James as leaders of the church, but quite different agendas. Acts 18 there are some people who only knew that John the Baptist had come, not Jesus as the messiah, not had they received the Holy Spirit! Rome appears to have had some form of Christianity before Paul or Peter arrived there, so that Paul is greeted by the brothers when he arrives in Acts 28. The book of Acts becomes the beginning point of a trajectory from the first moments of the church to present practice. What are practices which “develop” from Acts, through the epistles and through Church history? Is there any danger to clinging too tenaciously to “church tradition”? Reading Acts on Reading Acts? I am teaching the book of Acts this semester, so starting this week will be actually reading Acts on Reading Acts. To celebrate I finally registered the domain for Reading Acts (so no more .wordpress in the URL, no ads and faster load times). They tell me I can use video now, although I doubt anyone really wants to see me blogging. In the first week or two of the series, I will be working through some problems for reading Acts as a historical and theological document, then I will work my way through the book chapter-by-chapter. I will often use Craig Keener’s massive commentary on Acts as a discussion partner, but there are several new books in the last few years on Acts what will pop up over the next several months. A second reoccurring theme will use of Acts by the contemporary church. One of the real problems for teaching or preaching Acts is the application of the book to how we “do church” today. Some recent writers want to embrace an “Acts 2” lifestyle and try to be the church like it was in the earliest days. This is not without theological or practical problems. Using Paul as a model for doing ministry is another popular application, but is the presentation of Paul’s ministry intended as a “how to guide” for planting and organizing churches? A third thing I intend to do in this series is “ask good questions” even if I do not answer them. Since Luke cannot tell us everything about everyone, there are some real gaps in the book of Acts. What happens in those gaps may be as important as the story Luke tells. For example, where does Peter go when he leaves Mary’s house in Acts 12? We are not told, but the way Luke presents the material seems like a transition from Peter to James as the significant leader of the Jerusalem community. This “gap” in the story seems extremely to me in the overall history of early Christianity. This leads me to a fourth reoccurring theme. I do think Acts provides a framework for understanding early Christianity, not just in what he says but also in the direction in which he points. There are several places in the narrative foreshadowing where the story goes “beyond Acts.” For example, Paul’s speech in Acts 20 to the Ephesian elders strikes me as looking forward to the problems the church faced in the latter third of the first century. It is no coincidence that the book of Luke would have been circulating at the time. So that is the plan for the next few months, I hope you enjoy the series and I encourage you all to participate as fully as you would like. Garrett, Duane A. A Commentary on Exodus. Grand Rapids, Mich. Kregel, 2014. 741 pp. Hb; $39.99. Link to Kregel, including a sample PDF of the first 50 pages of the introduction. Duane Garret’s commentary on Exodus is the latest installment in the Kregel Exegetical Library (Alan Ross on Psalms, Robert Chisholm on Judges and Ruth). Garrett is well-known for his work in Wisdom Literature (Proverbs, Ecclesiastes, Song of Songs in the NAC series, Song of Songs / Lamentations in the WBC, and a forthcoming commentary on Job in the Evangelical Exegetical Commentary series from Logos) as well as the Hosea and Joel volume in the NAC series. He has contributed a textbook Classical Hebrew (B&H). Third, Garrett analyzes Hebrew prose on a clause-by-clause basis. This is truly an exegetical commentary on the Hebrew text of Exodus. In this respect, the commentary is challenging to read for those with limited Hebrew language skills. Fourth, Garrett tries to argue the book of Exodus contains a series of poems in addition to the Song of the Sea (Exod 15). Fifth, Garrett attempts to make this commentary useful for pastors and Bible teachers. He does not want to neglect what he calls “thorny problems,” but often relegates the details of his arguments to the footnotes. Last, Garrett reads Exodus is as a Christian theologian. He pays attention to the New Testament and Christian doctrine knowing the commentary will be used by Christian ministers, pastors, and Sunday school teachers as they prepare sermons and lessons based on this important Old Testament book. The commentary is worth purchasing for the 145 page introduction to the book of Exodus. If I were teaching a class on Exodus (or even the Pentateuch) I would assign this section as a textbook since it summarizes many of the key problems for interpreters of Exodus in a very readable format. First, the introduction discusses the sources and composition of the book of Exodus. While he does briefly treat the documentary hypothesis, he is more interested in recent studies in the “Book of the Covenant (Joe Sprinkle) or T. D. Alexander’s study of the unity of Exodus 19:1-24:11. If someone attempts to study the sources of Exodus, there are more up-to-date methods to explore than “continually flogging the dead horse of the documentary hypothesis” (20). Second Garrett deals with the Hebrew text of Exodus and the translation method used in the commentary. For prose, he translates each clause separately, for poetry he attempts to make use of the cantillation system for translating lines of Hebrew text. Third, Garrett been offers a lengthy discussion of Egyptian History, including brief summaries of the reigns of key Pharaohs in the New Kingdom since this is the period in which the Exodus occurred. He follows Kenneth Kitchen closely with respect to chronology. The fourth section of the introduction is perhaps the most important. In reading a commentary on Exodus, most readers will immediately turn to the section on date of the Exodus. In this sixty-page section, Garrett discusses a range of options for the date of the Exodus. This introduction covers both the early and late dates for the date of the Exodus, but also “very early” and very late” dates. Garrett even includes several “eccentric positions.” This is one of the best essays I have read on the date of the Exodus! Garret points out each one of these positions have support from Scripture when interpreted in a literal, “most obvious” sense and each has at least some archaeological support. None of these positions should be described as the “liberal” or “conservative” view. He concludes: “the exodus, we may be sure, did happen as described in the Bible. On the other hand, we must be humble about our ability to assign it to a specific date” (101). He recommends that a Bible teacher for Pastor should simply avoid specifying the exodus took place during the reign of any specific pharaoh. The book of Exodus is simply called him “the pharaoh.” Having surveyed several eccentric views, Garrett also warns readers to avoid any revisionist Egyptian history. As he says “the Internet is awash in a weird theories of who the Pharaoh of the Exodus was together with major revisions of Biblical chronology that supposedly solve all the problems” (102). Despite the fact that Garrett does not specify a particular date or pharaoh for the Exodus he says that “I see nothing the causes me to distrust the Biblical account” (103). This sort of faith commitment to Scripture and agnosticism towards history may frustrate some less-conservative readers of the commentary. His dismissal of eccentric views will certainly anger readers who are committed to these fringe views. Yet I find Garrett’s comments appropriate and measured considering our lack of knowledge for the details of this period of Israel’s history. Another major issue users of a commentary on Exodus are interested in is the location of the Red Sea (yam suph) and Mount Sinai. He summarizes a “southern Sinai Peninsula theory” supported by Hoffmeier and a “NorthwestArabia theory” offered by Colin Humphreys, a physicist from Cambridge University. A third view begins with Paul’s statement in Galatians 4:25 that Sinai is in Arabia. Garrett asks, which Arabia would Paul refer to? It is entirely possible that Transjordan and the region of the east of the Dead Sea could be described fairly as Arabia when Paul wrote. Garrett concludes that Humphreys’s solution is the best available and that the Red Sea is the north end of the Gulf of Aqaba (134). After all of this historical detail Garrett concludes the introduction to the commentary with a brief eight page summary of the message of Exodus. This section places Exodus is within the overall narrative of Old Testament theology. Particularly useful is the section on the nature of Yahweh. He also offers a few comments on the presentation of Moses in the book. Garret devotes about a page on “Egypt as a symbol of worldly power.” Since there is a great deal of theology of liberation based on God’s rescue of his suffering, poor people from the oppressive government of Egypt, I would have expected a longer section here. The body of the commentary breaks the book of Exodus into sections. Each section begins with a phrase by phrase translation. In sections Garrett finds poetry, he includes the phrase-by-phrase translation along with the Hebrew portion and an indication of syllable count. This will help the reader to follow the flow of the Hebrew poetry. Garrett deals with Hebrew grammatical matters in footnotes. These notes deal primarily with matters of Hebrew syntax although occasionally he will discuss lexical issues. Each section structured into an outline prior to the commentary proper. Within the commentary Garrett occasionally refers to the Hebrew or Greek text without transliteration. For the most part Garrett does not interact a great deal with other commentaries, but occasionally there are a few footnotes pointing to key articles for positions in other commentaries. After the commentary section Garrett offers a few theological summaries by way of bullet points. These are simple observations based on the commentary and will be very useful for pastors and teachers working through Exodus. There are a few excursus scattered through the commentary. Conclusion. I find this commentary to be one of the best that I have read in the Kregel Exegetical Library so far. The introductory material is superlative and worth the price of the book alone. Garrett writes as a believer, yet as a scholar who is intimately aware of the historical complexities of the book of Exodus. His comments on the Hebrew text are excellent and reflect an expert knowledge of Hebrew syntax and grammar. While these features may challenge some readers this commentary is nevertheless an excellent resource for pastors and teachers hoping to preach the book of Exodus. NB: Thanks to Kregel for kindly providing me with a review copy of this book. This did not influence my thoughts regarding the work.